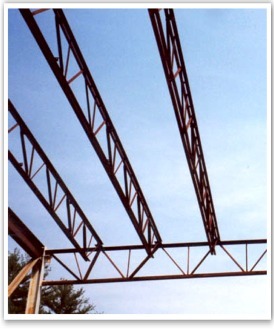 In structural engineering, the Open Web Steel Joist (OWSJ) is a lightweight steel truss consisting, in the standard form, of parallel chords and a triangulated web system, proportioned to span between bearing points. The main function of an OWSJ is to provide direct support for roof or floor deck and to transfer the load imposed on the deck to the structural frame i.e. beam and column.